This is the time of the year where motorsport lovers are going through serious withdrawal while waiting for the 2014 racing season to start. Though Christmas works as a fun-filled time for auto racing fans, January can exist as a depressing time in North America as major series such as NASCAR and IndyCar are at rest competitively. With the Rolex 24 Hour of Daytona in a seemingly distant future, hard-core auto racing enthusiasts need a relief from potential boredom. Dependant on whether a recipient truly was a good boy or girl, the Eleventh Day of Car Gifts has a top-notch racing simulator filling the prescription for motorsport withdrawal. While a good racing game found on a brand new gaming system such as the Sony PlayStation 4 or Xbox One will suffice for most of us, others will want to race on the edge of reality. Available through Hammacher Schlemmer, the Stock Car Racing Simulator is the ultimate way to obtain a true sense of adrenaline of professional motorsports. Containing all the controls native to a full-bodied race car inside a steel cage, the Stock Car Racing Simulator is surrounded by fiberglass bodywork wearing graphics similar to what would be found on an ARCA (American Racing Club of America) stock car. Running off an included gaming PC, the Stock Car Racing Simulator is preinstalled with ARCA Sim Racing software. 21 race tracks including Daytona International Speedway are available for gamers. The ARCA Sim Racing software applied to the Stock Car Racing Simulator contains such as level of realism and depth that professional ARCA and even NASCAR drivers such as Michael McDowell have used it for training. The Stock Car Racing Simulator employs a 1,680 x 1,050 resolution, 22-inch LCD monitor and a 5.1 surround sound system to accurately replicate what would be seen as well as heard on a race track wielding an under three-ton race machine. This racing simulator is in no way a simple under-the-tree item. 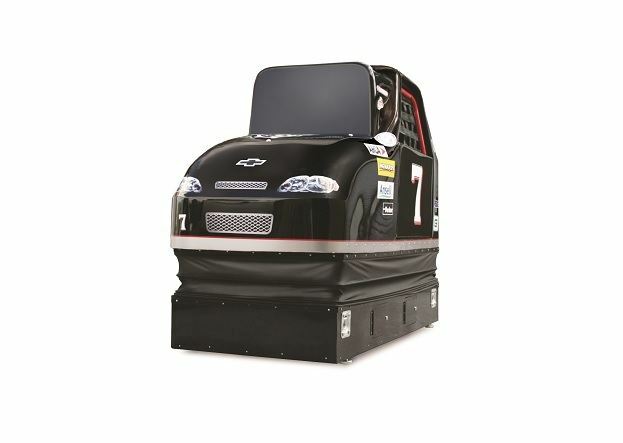 With dimensions spanning 78” by 36” by 64”, the Stock Car Racing Simulator is a heavy-duty rig weighing 1,000 pounds. Beyond a simple video gaming system, the Stock Car Racing Simulator contains a base full of electric actuators that recreate the racing forces encountered on the race track. Transitions through banking, jack lifts during pit stops and other sensations are provided to the user of the Stock Car Racing Simulator. The steering wheel and pedals have also been configured to allow realistic resistance while racing in the simulated track environment. A padded racing seat and window net is added to the Stock Car Racing Simulator for an additional sense of fantasy. A completely immersing experience, the Stock Car Racing Simulator does come at a price. The Stock Car Racing Simulator is listed at $60,000 on the Hammacher Schlemmer website. Consider it this way, racing in the ARCA Racing Series would cost significantly more than simulator’s price and doesn‘t come with the worry of wrecking an actual race car. No Comments on "Eleventh Day of Car Gifts: The Stock Car Racing Simulator"